Decaying beech (Fagus grandifolia) leaves trapped under ice, Gory Brook, Rockefeller State Park Preserve, Sleepy Hollow, NY. Canon 7D, 180mm f/3.5L macro lens, ISO 100, f/18, 0.6 seconds. As I mentioned in my previous post from this series "Snow Day," winter is a marvelous time for macro photography because the muted colors and relative paucity of subjects allows you to slow down and really appreciate pattern, form, and design. In this particular series of images, I was focusing on pattern and particularly on texture. 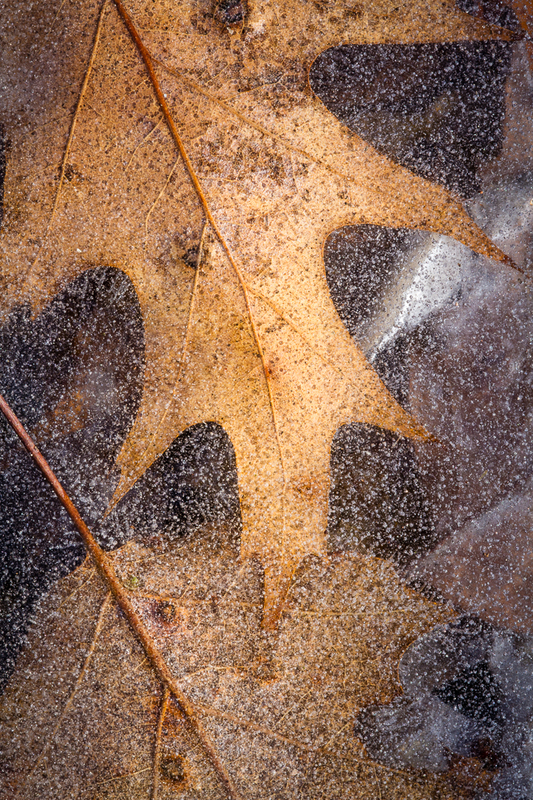 Oak (Quercus) leaves trapped under ice in a swamp along the Pocantico River, Rockefeller State Park Preserve, Sleepy Hollow, NY. Canon 7D, 180mm f/3.5L macro lens, ISO 100, f/22, 1/5 second. I found several pools that were full of decaying fall leaves and in places the leaves were trapped just below the surface of the ice. Shooting through the ice muted the colors of the leaves (which were already muted through decay). 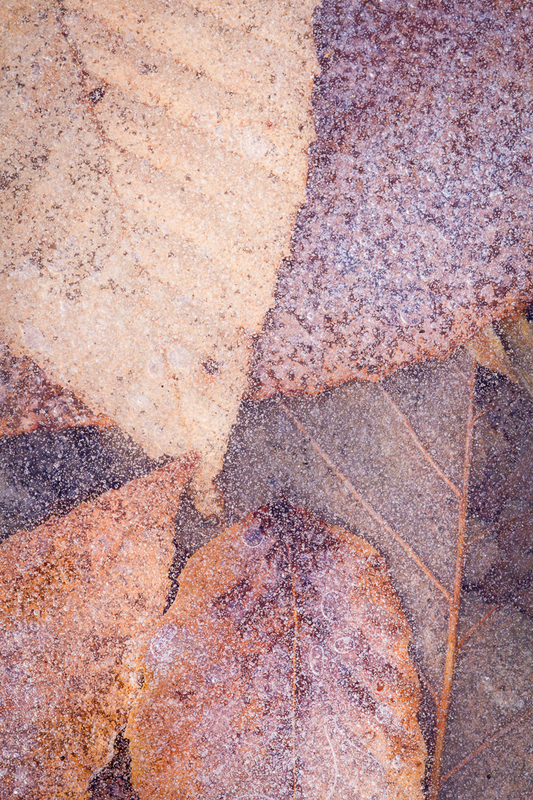 The combination of decay before the cold weather set in and the air bubbles trapped in the ice added a lot of texture to the images as well. Decaying beech (Fagus grandifolia) leaves trapped under ice, Gory Brook, Rockefeller State Park Preserve, Sleepy Hollow, NY. 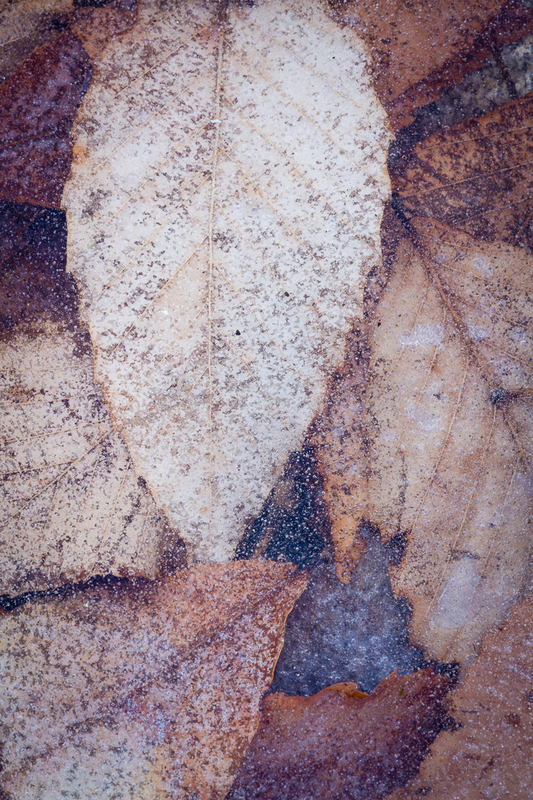 The missing squares on the leaf due to decay adds to the textured effect. Canon 7D, 180mm f/3.5L macro lens, ISO 100, f/16, 0.4 seconds. This ice effect reminded me of when folks desaturate color images and add textures to photographs in post-processing to invoke feelings of nostalgia or make a photograph look old. While it can be effective, I often find this post-processing technique looks contrived or at the very least cliched. But here was a genuine and honest invocation of that nostalgic effect, using only the unaltered subjects that nature provided. Canon 7D, 180mm f/3.5L macro lens, ISO 100, f/18, 1.0 seconds. It was a very "zen" experience sliding and searching around the ice to find the most pleasing arrangements of leaves and then moving the camera around until the composition drew the eye into and around the frame. I looked for arrangements that had one or two prominent leaves and then background leaves that enhanced, rather than distracted from those main shapes. 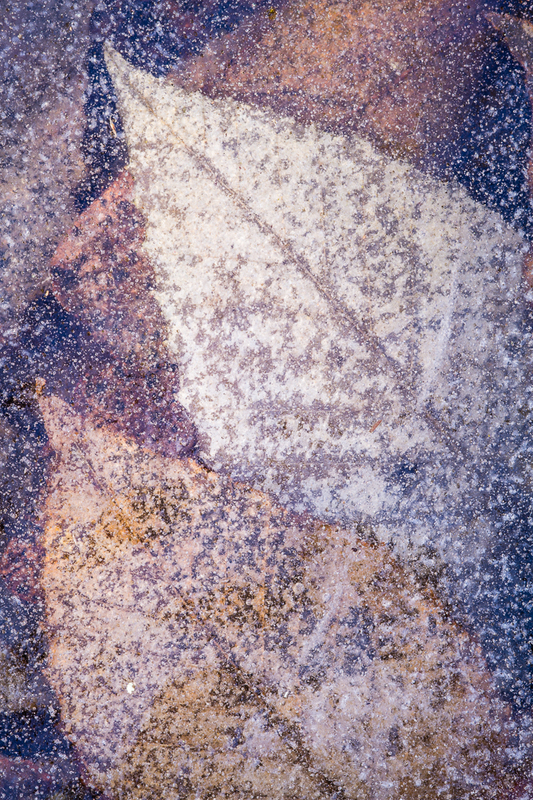 Compositions with just a single leaf, with little background detail, were too simplistic and did not work well. But compositions with too many background leaves, or leaves that were too mutilated or were imbedded at multiple levels in the ice, were distracting and tended to move the eye out of the frame or away from the main subjects. I hope you enjoyed these peaceful images and that you have a chance to get out and enjoy the quiet beauty of winter before spring is upon us once again.